Helge Lunde (1961) has been a longtime advocate for freedom of expression. 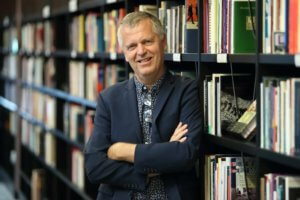 He was the director of Kapittel, Stavanger International Festival of Literature and Freedom of Speech from 1998-2005. During the same period, he was responsible for Stavanger as the City of Refuge for persecuted writers, and he worked together with Norwegian PEN to develop the network throughout Norway and beyond. 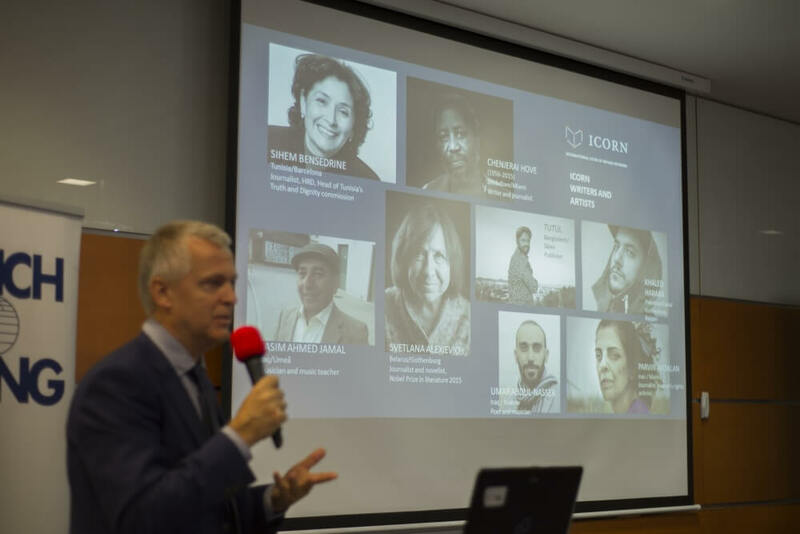 Lunde was among the main figures behind establishing ICORN, the International Cities of Refuge Network in 2005 when the original network International Parliament of Writers was dissolved. He became its first executive director, a position he has been holding since. He is the current Executive Director of ICORN. In this interview with Shuddhashar, he speaks about his work with ICORN, his hopes for exiled writers, and his concerns about the future. Shuddhashar: Thank you very much for agreeing to this interview even during this busy period in your life. We would like to start with a slightly personal question. You have been working with ICORN since its foundation. How did you start the work that you are involved with? When you started, what were the ideas and plans? What motivated you to be involved in this kind of work? Helge Lunde: Thanks a lot, Tutul, it is a great honor to be in touch with you and to contribute my thoughts and reflections in Shuddhashar. When I started to work as a festival director for the Kapittel International festival of literature and freedom of speech in 1998, my job description included Stavanger as a city of asylum for persecuted writers. Just months before, the extraordinary Yemeni poet Mansur Rajih had escaped 15 years imprisonment and had become a guest writer in Stavanger. Mansur made a huge impression on me from the very beginning. I will also mention the former president of Norwegian PEN, Kjell Olaf Jensen. We got in touch about the programming of the Kapittel festival, but soon we also started to work together to recruit other Norwegian cities to host persecuted writers. Kristiansand came first, then Oslo, then Trondheim, and your city Skien was also quite early signing. Kjell Olaf sadly passed away a few years ago, but we all know that he is very much behind this work in Norway, and indeed also in the larger world. Shuddhashar: You were directly involved with the foundation of ICORN. We would like to know about the background of the formation of ICORN. Under what circumstances was it necessary to start such a project? Please tell us about your observations of the changes in the situation between 2006 and 2018. Helge Lunde: Stavanger and the other early cities of asylum belonged to the International Parliament of Writers Network of Cities of Asylum (INCA). INCA was started in 1995 by Salman Rushdie and his writer colleagues, and it was based in Paris. In 2003 and 2004, IPW and INCA came into serious administrative and financial difficulties, and they were closed in 2005. Stavanger and Norwegian PEN invited the remaining cities (among them Stockholm, Amsterdam, Norwich, and Barcelona) to Stavanger later that year to see if we could learn from the successes and failures of the former network and start something new. The conclusion was yes, and then first “CORN”, and then later the less “corny” and more international ICORN – the International Cities of Refuge Network – was born. Shuddhashar: What have been the benefits and challenges of having ICORN based in Norway? Helge Lunde: When the Paris-based INCA network really started to run into trouble, the development in Norway was the other way around. Thanks to the strong collaboration between the first Norwegian cities of refuge and Norwegian PEN, more and more cities in Norway were recruited, and a Norwegian brand started to develop even before ICORN was born. There were two main differences between INCA and ICORN when it started back in 2006: ICORN learned that the member cities needed to be strongly involved in running the network, and contrary to what had been the fact with IPW/INCA, we learned from day one that we would benefit by attaching to PEN International’s global network of committed writers and experts. A challenge with running a global CSO from Norway, however, is, of course, the high-cost level: few international human rights/freedom of expression donors believe that a creation in oil-rich Norway can be in need of substantial financial support. Shuddhashar: Global human rights violations, the suppression of free speech, and the refugee crisis are all getting worse daily. What are some of the key factors you would like to highlight in relation to these issues? Helge Lunde: The general climate of populism in our age of Trump, Brexit, and the like is extremely worrying. I am not so afraid for the American democracy, it is well-founded with lots of former and present heroes protecting it. But when truth decays, journalism falters, and it has become more important to erect walls than to build bridges. In this context, the fight against xenophobia and racism, and for human rights and freedom of expression, becomes all the more important today. Shuddhashar: How would you describe the role of art in the world and the importance of artistic freedom? With all the challenges the world currently faces – poverty, inequality, war, climate change – what role do art and artists play? Helge Lunde: Art is the breath of society, and indeed of democracy. When artistic freedom is curtailed, society starts to bleed, and democracy is hollowed out. When ICORN and PEN International convened together in Amsterdam in 2015, it was under the title “Creative Resistance.” I think that is an even more telling and important attitude to have when 2018 is ending. We of course know that all art is political, but that political art is impossible. But when art is free, the world will be a lot better equipped to deal with poverty, inequality, war, and climate change. Artistic expressions can enlighten, scare, inspire, or reveal, or have all of these qualities within one piece of art. Shuddhashar: The refugee crisis is one of the biggest challenges facing the world at this moment. What advice would you give to the United Nations and the host countries in dealing with this crisis? Helge Lunde: The UN has established a Global Compact for Refugees and is about to ratify the Global Compact for Migration next month in Marrakech. The UN is not the scoundrel; it is its members that shies away from committing to ideas and practices that are needed to solve the most burning challenge (besides climate change) the world faces today. Running a network of cities (like ICORN), it is tempting to suggest that the UN, and the EU, should look closer to the potentials of dealing with and delegating power to cities when the good old nation-states succumb to narrow minded nationalism, populism, and xenophobia. Shuddhashar: Of the writers, journalists, and artists who are protected and allowed to live securely by ICORN and other such organizations, how many of them do you think are able to continue in their line of work? We are also interested in your observations about those who cannot or do not continue their work, and why they do not. Helge Lunde: That is an important question, and it may be one of the most critical and existential challenges a network like ICORN is facing. ICORN never was for escaping only for the sake of escape, or reach the west and become rich and comforted. The persecuted writers and artists who have reached an ICORN city have made immense sacrifices to establish themselves in a safer climate so that their fight for freedom of expression, human rights, and democracy can continue without repression, fear, threats, and even torture and death. That is the basic story. What we see is that most of the ICORN writers/artists finds ways to connect in one or another way with the country or community they were forced to leave behind. Not always immediately, and sometimes it is a lot scarier than they had hoped. Of course, it also happens that some writers/artists seemingly never manage to continue their lines and communication with their home countries, which we indeed should accept. One important matter is that of patience: maybe some efforts or expressions by an exiled artist does not have the intended effect the first week, month, year, or ten years, but then suddenly plays an enormously important role for a social upheaval fifteen years later. Shuddhashar: Those writers, journalists, and artists who are able to reach the safe haven of a new country – what kinds of problems do they face in their new environments? What kinds of steps can be taken to alleviate these problems? Helge Lunde: Exile is always by definition about loss, suffering, uprootedness. But our task, together with the displaced ones, is to look for new possibilities, for new meanings, and new ways of preserving the spirits and capabilities of each individual person that has been forced to flee. Shuddhashar: What kinds of programs can play an active role in allowing these refugee writers, journalists, and artists to become integrated into the mainstream arts and literary traditions of their host countries? Helge Lunde: Here we have lots of possibilities, as long as the challenges are recognized, and we are able to mobilize enough energy and creativity to move on together. The idea with ICORN as such is to function this way, to make the whole network an exchange machine for ideas, experiences, and best practices. One has to work locally, regionally, nationally, and internationally. Governmental organizations and NGOs should work together, at least in countries, like for instance Norway, where that is possible. Shuddhashar: What would you like to say or explain to regular people in the cities where writers or artists-at-risk are given shelter? Helge Lunde: Ideally, I should not have to say or declare too much; the citizens should become aware of the huge resources the guest writers and artists are representing by themselves. But sometimes good people also need to be reminded about things. Sometimes patience is needed as well, both from artists and natives – but active patience, not passivity. Shuddhashar: There are countless writers and artists facing increasing threats in various countries around the world. What advice would you give to those who are not able to shelter themselves from potential arrests and attacks? Helge Lunde: It is hard for me to give general advice about so extremely grave and serious matters. But it is always a good idea to link up with people and take precautions before things are getting too ugly. Continue to be brave, but do not gamble with your or your relatives/friends’ lives. ICORN is one alternative, and there are many others if it is impossible to stay on. Shuddhashar: There are many writers who are stuck in transit without visas. They cannot return to their home countries, nor are they able to permanently settle elsewhere. In such situations, their children’s healthcare and education are also severely affected. This is a terrible crisis. What is your suggestion to deal with such a difficulty? Helge Lunde: We have to look at each situation individually. And then, of course, work to improve the situation on all levels. ICORN holds a side event together with PEN International next month when the UN shall endorse the Global Compact for Migration. We have joked many times, saying we seek funding for an ICORN helicopter to fly anywhere to pick up writers and artists at severe risk. But of course it is not only a joke; a long-term, temporary globally valid ICORN visa should not, in fact, be a distant dream. Shuddhashar: Do you think another world war is forthcoming? If so, why do you think such an outcome is on the horizon? Helge Lunde: Well, at this moment tension is building up dramatically between Russia and Ukraine. The present world order with Trump in charge of what used to be the champion of the free and peaceful world does not make me very optimistic. As said above, it is the general destabilizing of relations between countries and alliances that is maybe the worst effect of how the US president and comrades are moving ahead. If we allow all intergovernmental institutions and cooperation structures to dissolve, we suddenly have no tools to solve a grave emergency when it happens. And then things can become really ugly. Shuddhashar: At the same time, you must also dream of a humane, democratic, and just world? How can we build such a world? Helge Lunde: Yes indeed. First and foremost, by not giving in. Again, full speed on all levels: work and cooperate on local, regional, national, and transnational platforms. We have to believe in what we, for instance with ICORN, do and to embolden ourselves by trusting that our values, solidarity, creativity, and hospitality will not go out of fashion. The need for these values will increase. One very small, but significant, sign for the better is that when the world’s largest book fair, the Frankfurt one, is planning their 2019 edition, they want ICORN, as a champion for human rights, freedom of expression, international solidarity, to play a prominent role. Shuddhashar: You are doing very important work, and those of us who have received shelter are incredibly grateful. Still, it must also be difficult work for you at times. What inspires you to keep going? What words of inspiration do you have for others?